If you’ve ever inhaled the stench of a carpeted Bikram studio—where buckets of hundreds of peoples’ sweat seep into the fibers daily—you know that a germophobe doing hot yoga is like an acrophobe taking up mountain climbing. Sunshine Daidone (a self-described germophobe) is working to change that. So Daidone decided to open her own clean, pristine studio, Poe Yoga, in 2013. Poe’s original location is in Far Hills, NJ, and it started to generate buzz during a three-year lease term in East Hampton (which ended last year). Now, it’s picking up more steam, with three recently opened locations in Short Hills, Westfield, and Fairhaven, NJ—and plans to expand far beyond the Garden State. “We’re going to focus on California and Brooklyn, possibly Connecticut, and the Hamptons, next,” says Daidone, who adds that she’s eyeing four additional studios by the end of 2017. What’s driving her (sterile) success? 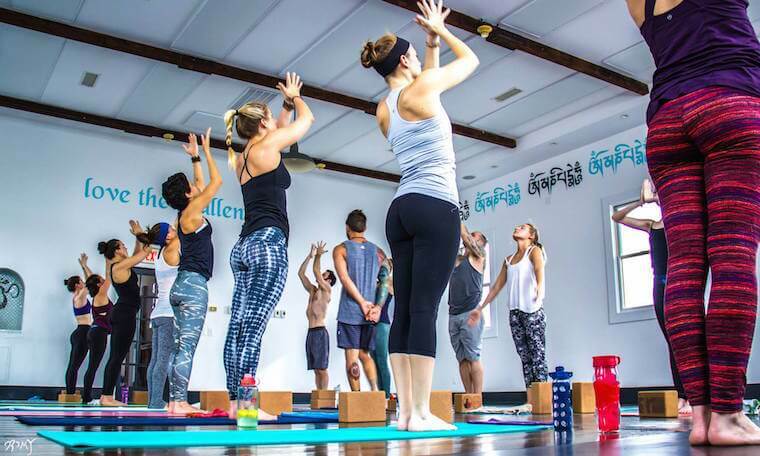 Poe’s studios differentiate themselves by using FAR infrared heating panels instead of forced hot air, a system that’s popular in saunas and is becoming more common in hot yoga, at popular studios like Y7. But Daidone says Poe takes it a step further, by combining the heat panels with an oxygen purification system and humidifier that perfectly calibrates the air quality. “We never get steam, the air isn’t thick. It’s just a pure, clean, fresh heat,” she says. They also have cleaning staff on-site and other amenities to make the experience feel luxe, like Mullein & Sparrow products in the showers and a signature scent that fills the spaces. Also likely? You’ll spot someone in class wearing a pair of K-Deer leggings—here’s why. And if Poe Yoga has got you thinking about gym germs (this might do the trick, too), you’ll want to check out our tutorial on properly cleaning your mat.